This background memo was originally published in March 2017. A updated version was published in March 2019. A well-funded, highly coordinated national effort is underway to call a constitutional convention, under Article V of the U.S. Constitution, for the first time in history. The result of such a convention could be a complete overhaul of the Constitution and supporters of the convention are dangerously close to succeeding. With special interest groups gaining more momentum, conservative advocates are just six states short of reaching the constitutionally-required 34-state goal. They are targeting Republican-controlled legislatures in 2018 and are within striking distance. The unknowns surrounding a constitutional convention pose an unacceptable risk, particularly in the current polarized political climate. Given how close calling a new convention is, it’s time to spotlight that risk and sound an alarm for the preservation of our Constitution. Too few Americans are even aware that a constitutional convention can be called, let alone that there would be no checks on its scope and further that the process to call one is well underway and being underwritten by some of the nation’s richest individuals. Calls for a convention are coming from right and left, with more money, a stronger campaign structure, and national coordination on the right. A number of major conservative organizations and donors, including Mercer family and Koch-funded groups such as the American Legislative Exchange Council (ALEC), have renewed and intensified efforts to thrust this issue into the spotlight after years of inactivity. This memo that outlines the different campaigns calling for an Article V convention and why it is just a dangerous idea. These calls for a constitutional convention represent the most serious threat to our democracy flying almost completely under the radar. The U.S. Constitution offers two ways to add amendments to our nation’s governing document in Article V. The process that has always used for all 27 amendments added to the Constitution since 1789 is for an amendment to pass with a two-thirds vote in each chamber of Congress and then be ratified by three-fourths of the states. The other, untested way laid out in Article V is for two-thirds of state legislatures to call for a constitutional convention, also known as an “Article V convention,” to add amendments to the Constitution once they are ratified by three-fourths of the states. Throughout the 230-year history of the U.S. Constitution, an Article V convention has never been called by Congress. The Constitution offers no guidelines or rules on how a convention would work or if a convention can be limited to considering one amendment or subject. Since the Constitution offers no guidance on how applications for a convention should be counted, scholars have offered various legal opinions on the counting of convention applications, but it is generally agreed that all applications from two-thirds of the state legislatures (34 states) should be on the same issue for a convention to be called. While there are several ongoing pro-convention campaigns, the effort to add a federal balanced budget amendment (BBA) to the Constitution has progressed furthest. Throughout the 1970s and 1980s, dozens of state legislatures passed resolutions or “calls” for an Article V convention to propose a balanced budget amendment. Some BBA proponents claim that by 1989, 32 states had called for a convention for a balanced budget amendment. Concerns about a potential runaway convention, plus an intensified drive to push a BBA through Congress, led over a dozen states to rescind their convention calls between 1989 and 2010. However, conservative interest groups have revived the convention plan, persuading more than a dozen state legislatures to pass Article V convention calls since 2011. With the help and endorsement of the American Legislative Exchange Council (ALEC), a corporate lobbying group masquerading as a charity, the Article V BBA campaign has gained steam in the last eight years. Most convention proponents now agree that 28 states have “live” calls for a BBA convention (i.e. where the state has not passed a rescission to nullify an earlier call); that means they are just six states shy of the constitutionally required 34 applications. There are also six GOP-controlled state legislatures controlled that do not have an Article V BBA application on the books: Kentucky, Idaho, Minnesota Montana, South Carolina, and Virginia. Those will be the main targets for the 2019 sessions. In March 2019, former Wisconsin Governor Scott Walker became the National Honorary Chair of the Center for State-led National Debt Solutions, one of the main groups advocating for the BBA convention applications in the states. Due to the threat of an Article V convention, several state legislatures have rescinded their Article V BBA convention applications, including Delaware (2016), New Mexico (2017), Maryland (2017), and Nevada (2017). 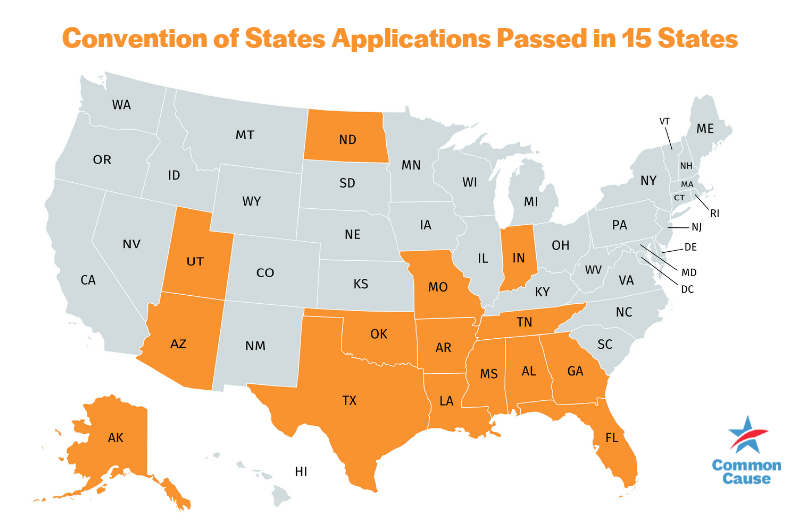 Had those four states not rescinded their applications, BBA convention proponents would be at 32 states, just two away from reaching the 34-state goal. Another conservative effort to call a new constitutional convention, known as the “Convention of States,” is also underway. This proposal calls for a convention for the broad purposes of limiting the powers of the federal government, imposing fiscal restraints on federal spending, and applying term limits for Members of Congress. The vague language in the Convention of States proposal perfectly illustrates the threat of a runaway convention. The Convention of States effort has major resources behind it, including at least $500,000 from the Mercer family (known for their support of President Trump and Republican candidates) and numerous large contributions from the Koch-connected Donors Trust. The well-funded Convention of States campaign is led by Tea Party Patriots co-founder Mark Meckler and former U.S. Sens. Tom Coburn, R-OK, and Jim DeMint, R-SC; DeMint also is a former Heritage Foundation president. The campaign has garnered major endorsements from other major conservative media personalities, elected officials, and special interest groups, including Senator Marco Rubio, former Arkansas Gov. Mike Huckabee, Texas Gov. Greg Abbott, Senator Rand Paul, former Florida Gov. Jeb Bush, Mark Levin, Sean Hannity, Pete Hegseth, Allen West, former Alaska Gov. Sarah Palin, Florida Gov. Ron DeSantis, the American Legislative Exchange Council (ALEC), and others. In September 2016, the Convention of States held a mock convention to come up with proposed amendments to the Constitution. The results show how they plan to use a convention to implement an extreme agenda into the Constitution and how a convention cannot be limited. The changes they proposed (found here) would drastically alter the federal government and put civil rights and needed programs, including Social Security, Medicare, and Medicaid, at risk. In just the last five years, the Convention of States resolution has passed in 15 states: Georgia, Alaska, Florida, Alabama, Tennessee, Indiana, Oklahoma, Louisiana, Arizona, North Dakota, Texas, Missouri, Arkansas, Utah, and Mississippi. The is also an effort underway to call an Article V constitutional convention for an amendment overturning the U.S. Supreme Court’s decision in Citizens United v. FEC. Leading this effort is a group called Wolf PAC, founded by left-wing political commentator Cenk Uygur. Since 2014, Wolf PAC’s resolution has passed in just five states: Vermont, California, New Jersey, Illinois, and Rhode Island. Common Cause fully supports overturning Citizens United and other cases that have bolstered the undue influence of money in politics. We support a constitutional amendment as one path – but oppose an Article V convention as the mechanism, for the reasons that are discussed later in this memo. An amendment overturning Citizens United is by no means the only solution to reform our democracy so that people are put first; it must be part of a larger context of solutions including public financing of elections, strong disclosure of political spending, election administration modernization, impartial redistricting reform, and other pro-democracy solutions. THREAT OF A RUNAWAY CONVENTION: There is nothing in the Constitution to prevent a constitutional convention from being expanded in scope to issues not raised in convention calls passed by the state legislatures, and therefore could lead to a runaway convention. INFLUENCE OF SPECIAL INTERESTS: An Article V convention would open the Constitution to revisions at a time of extreme gerrymandering and polarization amid unlimited political spending. It could allow special interests and the wealthiest to re-write the rules governing our system of government. LACK OF CONVENTION RULES: There are no rules governing constitutional conventions. A convention would be an unpredictable Pandora’s Box; the last one, in 1787, resulted in a brand-new Constitution. One group advocating for a “Convention of States” openly discusses the possibility of using the process to undo hard-won civil rights and civil liberties advances and undermine basic rights extended throughout history as our nation strove to deliver on the promise of a democracy that works for everyone. THREAT OF LEGAL DISPUTES: No judicial, legislative, or executive body would have clear authority to settle disputes about a convention, opening the process to chaos and protracted legal battles that would threaten the functioning of our democracy and economy. APPLICATION PROCESS UNCERTAINTY: There is no clear process on how Congress or any other governmental body would count and add up Article V applications, or if Congress and the states could restrain the convention’s mandate based on those applications. POSSIBILITY OF UNEQUAL REPRESENTATION: It is unclear how states would choose delegates to a convention, how states and citizens would be represented in a convention, and who would ultimately get to vote on items raised in a convention. Simply put, an Article V constitutional convention is a dangerous and uncontrollable process that would put Americans’ constitutional rights up for grabs. At a time when extreme gerrymandering has created unprecedented polarization and big money buys access and influence for a few very wealthy special interests, a new constitutional convention would lead to chaos; the interests of everyday Americans would be shut out of the ultimate closed-door meeting. There would be no way to limit the scope of a constitutional convention and no way to guarantee that our civil liberties and constitutional process would be protected. Due to the threat of a runaway convention and the lack of rules to protect Americans’ constitutional rights, more than 230 public interest, civil rights, government reform, labor, environmental, immigration, and constitutional rights organizations released a statement in April 2017 opposing calls for an Article V constitutional convention. Organizational signers of the letter include CommonCause, the Center on Budget and Policy Priorities, Democracy21, the AFL-CIO, AFSCME, Americans for Democratic Action, the League of Women Voters of the United States, Dream Defenders, the Sierra Club, the NAACP, the National Council of La Raza Action Fund, the National Education Association (NEA), SEIU, the Campaign Legal Center, Greenpeace, People For theAmerican Way, Daily Kos, the National Women’s Law Center, and the Brennan Center for Justice. Although pro-convention campaigns are being proposed on the right and left, Democratic and Republican legislators alike have opposed calls for a new convention due to the threat it poses to Americans’ civil rights and liberties. During the 2017 sessions, Republican-controlled legislative chambers in Idaho, South Dakota, North Carolina, Utah, and Wyoming voted against calls for an Article V convention proposed by conservative groups. 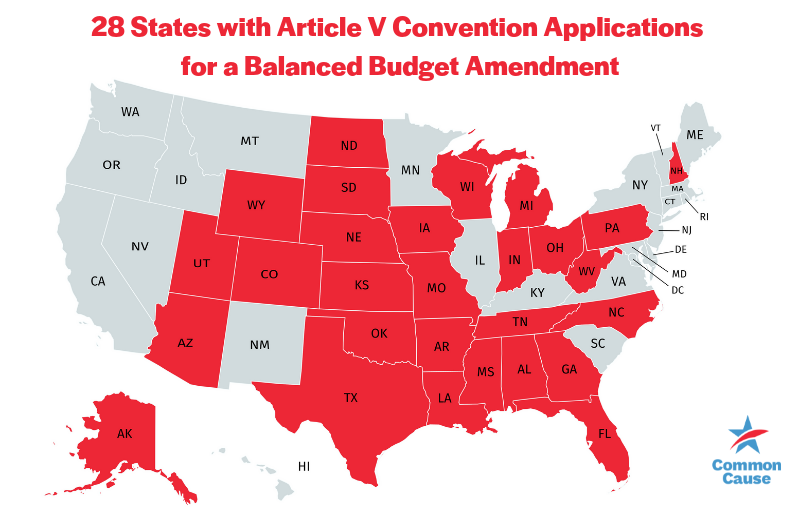 Likewise, Democratic controlled legislatures in Delaware, New Mexico, Maryland, and Nevada have rescinded their applications for an Article V convention for a balanced budget amendment in recent years. In the 2018 sessions, numerous legislative committees and chambers controlled by both parties rejected Article V convention applications in New Mexico, Idaho, Colorado, Maryland, Hawaii, South Dakota, Massachusetts, Kansas, Virginia, and New Hampshire. Tell your lawmakers to hold firm against an Article V convention. We must not allow unelected, unaccountable delegates to rewrite our Constitution with zero checks and balances. Reject any and all calls for an Article V convention.